January marks mid-winter up here in the northern hemisphere. It’s the time of year when the days are still short, the mornings are frosted over and the glittery excitement of the holidays is replaced by the glum realization that a whole lot of winter remains. Animals and plants have gone to bed or moved south for the winter, and for us omnivores, the bountiful summer days of freshly picked tomatoes, cucumbers and peaches seem very far away. Luckily, there are heroes of the season hiding right under our noses in cellars, storage bins and fridge drawers: root vegetables. These humble underground denizens not only play a crucial role in the growth of plants by absorbing water and nutrients and anchoring them to the earth, but they are also edible storage vessels that contain starches, sugars and nutrients. And since many of these soil-dusted specimens keep well in cool places for months after they are harvested, they are among the rare local vegetable that can be eaten all winter long in this climate. The term root vegetable encompasses a wide array of foods that aren’t all technically “roots.” These include bulbs like onions and garlic, rhizomes like ginger and turmeric, tubers like potatoes, yams and sunchokes, tuberous roots like sweet potatoes, and, of course, actual roots like parsnips, carrots, rutabagas, celeriac, and beets. 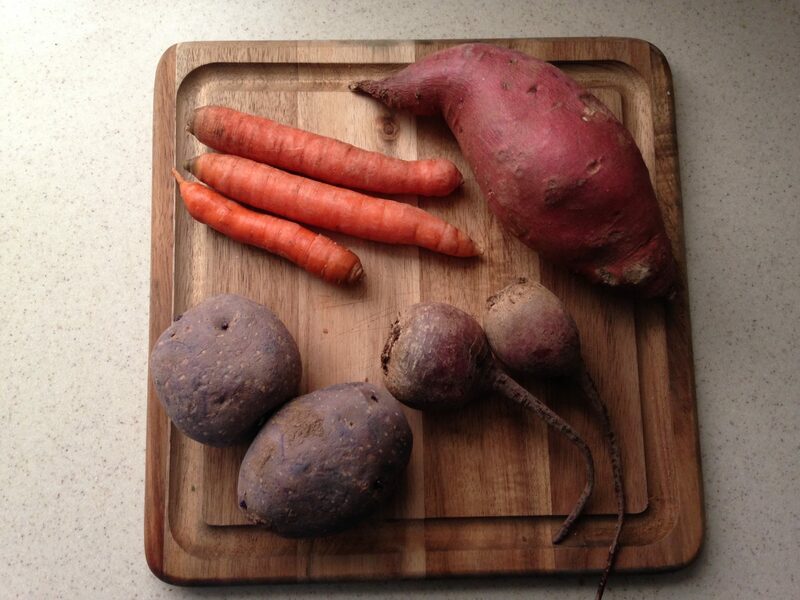 Root veggies are great sources of Vitamin A, Vitamin C, potassium, magnesium and dietary fiber. They also tend to be lower in calories and have a lower glycemic index load, which makes them ideal nutrient-dense vessels of natural starch and sweetness. And found among the menagerie of root veggies are versatile winter ingredients whose applications are endless. Root vegetables can be roasted, baked as main dishes, added to soups or tossed with salads. Some of my favorite things to do with root vegetables include roasting carrots to toss in grain salads, mashing potatoes with roasted garlic and rosemary, grating beets into salads, loading up baked yams with ingredients like dressed arugula and quinoa and making my once-a-year decadent Christmas side of potato and fennel au gratin. But my ultimate go-to for root vegetables is to simply cut up a mess of them and roast them in the oven until they are browned at the edges, slightly charred and utterly delicious. The dry heat of the oven helps caramelize the natural sugars, which coaxes out an amazing depth of flavors. Not only is this dish easy and economical, it also makes enough to last for days. It’s a great accompaniment to a baked chicken breast or steak, and when I’m not in the mood for meat, I like the veggies with a fried egg on top. Think of this recipe as a template; these veggies can be swapped out for others like bell peppers, green beans, Brussels sprouts or cauliflower. Preheat oven to 400 degrees. Toss yam, potatoes and onion in large roasting pan with half of olive oil, sprinkling with salt and pepper. Roast in the oven for 8-10 minutes, until the onions begin to get soft and translucent. Add carrots, parnips and beets and toss well to mix. If the roasting pan is full, divide contents into two pans and roast side by side. (The vegetables caramelize better when they have room to breathe.) Sprinkle with thyme leaves and add more salt and pepper and remaining oil before returning to the oven. Let roast for about an hour, checking every 15 minutes to stir vegetables, or until the vegetables are browned at the edge and tender when pierced with a fork. Add salt and pepper to taste, and enjoy.